The team wrote an invited review article on new mass spectrometry techniques for atmospheric science. A workhorse system in biological labs, mass spectrometry is being harnessed to analyze miniscule, rapidly evolving atmospheric particles that affect the climate and human health. Dr. Julia Laskin and Dr. Alexander Laskin at Pacific Northwest National Laboratory and Dr. Sergey Nizkorodov at University of California, Irvine wrote a comprehensive review of new mass spectrometry techniques suitable to studying these complex systems. 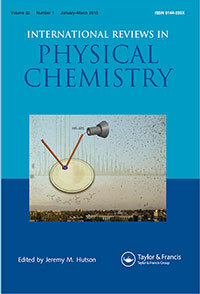 Their 42-page invited article has already reached the International Reviews in Physical Chemistry most read list. It is also featured on the journal's cover. "Analyzing complex, heterogeneous systems, such as atmospheric aerosols, and understanding their impact requires tools that can accurately identify and quantify hundreds of molecules," said Julia Laskin. "Ideally the analysis should be performed on a single particle." In the review, the team provided an overview of mass spectrometry techniques for bulk characterization of particles collected on substrates. They also discussed techniques for surface analysis of individual particles and surface chemistry of liquid drops. One of the techniques -- Nanospray Desorption Electrospray Ionization, or nano-DESI, Mass Spectrometry, developed at PNNL -- enables sensitive analysis of hundreds of organic molecules in aerosol samples. "Nano-DESI opens up opportunities for detailed analysis of different classes of compounds in bewilderingly complex mixtures," said Professor Nizkorodov. Anthropogenic and natural atmospheric particles affect the climate. The particles alter clouds and how the planet absorbs or reflects sunlight. Mass spectrometry will continue to play an expanding role in understanding these particles. However, integrating different techniques will be vital. "Gathering information on environmental particles is especially challenging because no single method of analytical chemistry gives the full range of data," said Alexander Laskin. "Scientists need to apply a variety of complementary analytical methods to get the big picture -- from single particles to complex molecular structures." Sponsors: Julia and Alex Laskin acknowledge the Chemical Imaging Initiative funded through Pacific Northwest National Laboratory's Laboratory Directed Research and Development program which allowed compilation of this review. The authors acknowledge previous and ongoing support for their research projects described in this review: U.S. Department of Energy's Office of Basic Energy Sciences, Chemical Sciences, Geosciences and Biosciences Division (Julia Laskin); DOE's Office of Biological and Environmental Research Atmospheric System Research program and the Environmental Molecular Sciences Laboratory's intramural research and development program (Alexander Laskin); and the National Science Foundation (Sergey Nizkorodov).